We strive to provide the highest quality of care in a loving environment where our team is always on hand to spend time with our residents, focusing on them as individuals and enabling them to make choices about their daily activities and routines. This may be something as simple as choosing to have a quiet read in our conservatory area or ‘putting’ a few balls on our Putting Green or going out for one of the many organised trips. Caring for our residents is at the heart of everything we do. Our commitment to providing the highest quality care is reflected in our team. They are passionate about the care they provide and they are supported by a highly qualified management care team which enables them to understand the complexities of caring for people with dementia. Jeff our Well Being Co-ordinator and Assistants enable residents to have a fulfilling and meaningful experience at The Chace. Our aim is to encourage and continue, previously enjoyed favourite activities and interests, as well as experiencing new ones. We also incorporate ordinary daily activities in order to maintain independence and structure to the lives of our residents. Special events and celebrations are held regularly and families and friends are always welcome. 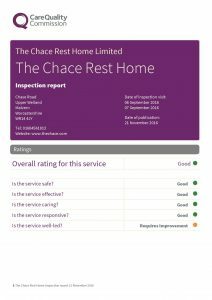 “I think the factors that make The Chace different from other homes is the cheerful atmosphere and the love and affection shown by the staff to residents. Nothing is too much trouble and the staff always have time to chat with residents and visitors. Unlike so many homes there is not a big circle of chairs with residents staring at the TV. Activities and music are important as is the garden which is an integral part of the home. The Well-being co-ordinator does a great job, as do all the staff.” Comments from one of our relatives.